When learning how to replace tanning bed lamps, you need to know is the wattage and "F" number of the lamp you need to replace, which 90% of the time, is a 100 watt, F71 type with bi-pin connectors on the ends. 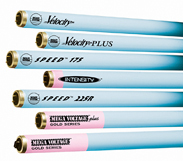 The easiest way is determine your type of bulb is to look at the label on the tanning bed or bulb itself. 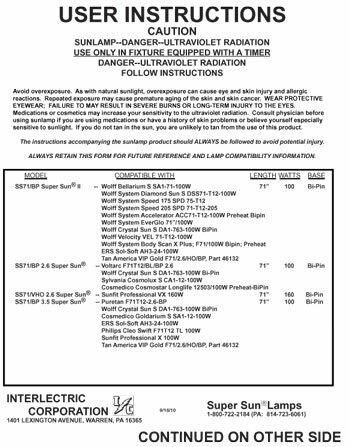 Normally, the tanning bed will have a label on the front next to a recommended exposure chart and list an "equivalent" lamp, like the Wolff Velocity or Belarium S models. For quick reference, you may check our compatibility sheet here to see examples, but basically you are searching for a wattage and "F" number in the sequence of numbers. You may also see a FR designation versus a "F" and they are interchangeable. If no FR or F number with a 71, 72, or 73 number is revealed on a label, you must "measure" the bulb and look at the "ends" to determine the bulb type. For instance, the F71 lamp is 69 3/8" long when measured from metal cap to cap. This is the MOST COMMON residential model replacement lamp and you can choose from many different manufacturers and models as long as they are 100 watt in the F71 length. If you know you have a F71 type click here to buy our discount lamp kits with FREE shipping. Forget about the reading the name on the label, like Wolff, Dual Sun, Cosmedico, Hi Sun, Dessert Sun, Turbo, Velocity, Real Sun, etc. The name means little because most bulbs are produced in the same factory in North America and the only factors which change are the bulb wattage and % of UVB versus UVA. Instead, look for F71, 72, etc and RDC, bi-pin type stuff. The rule of thumb with indoor tanning bed bulbs is when the % of UVB goes up, the bulbs become more burning or reddening, and as the % of UVB goes down, the lamps become more bronzing. Generally speaking, an average 20 minute commercial bed has a 5.5% UVB (thus 95% UVA) and is considered a "starter" type bulb which will not burn you in the early stages of tanning when melanin is not prevalent. A 15-17 minute, level 2 bed, will have 6.5% to 8.5% UVB bulbs, and a level 3 bed can either be a 8.5% or 9.5% "turbo" style bed or 12 minute 2% UVB bronzing bed or stand up booth. In summary, most home tanning bed owners desire a 6.5% UVB lamp because it is "safer" and it still stimulates melanin without burning, yet bronzes as well. Do not be fooled into thinking you need a "hotter" replacement lamp, because you can stay in a home tanning bed as long as you like. Also, you may have never felt the real heat of commercial lamps right out of the box, which have a 50 hour break in period, where they burn ever hotter. Commercial salon owners must move clients through the door and accommodate all tastes. In that case, a 7.5% or 8.5% UVB for their level 2 beds with 100 watt ballasts will be more appropriate. IF your state is un-regulated and your lamps do not have to be "compatible" with the manufacturer's original lamps, you can put any 100 watt bulb in a 100 watt bed if you are a salon owner or home owner. If you are a salon owner and not sure if your state is regulated, check here with your local state health department. If unsure of the wattage of your lamps, just check the label on the ballast in the power supply area of your sun bed. If you are in a regulated state, you must put in "compatible" lamps and a compatibility chart must be on file and presented upon inspection from the state health department. We ship a compatibility chart with each bulb order. Red light lamps are tightly controlled in Ohio, Florida, North Carolina, Texas, Iowa with more states joining the parade every day. Please contact your local health department before installing red light therapy bulbs in any commercial device. Red light beds and Lumiere type LED facial instruments are now considered class 2 medical devices and must be regulated accordingly.